Why was I so excited about CrossFit?? Seriously? Our new trainer cancelled yesterday. What’s up with that? He bailed on his first day, last Tuesday, and yesterday was his second cancellation. Not that I was terribly upset. After all, my arm muscles are still screaming at me from last week’s first attempt and his wimping out left me free to go biking!! I hopped on the work bike and hit the trails. Halfway to the south side, I was struck by an incredible flash of inspiration and decided to visit the Botanical Gardens. It’s only a quick jaunt across a major arterial roadway that doesn’t have a crosswalk or a signal, right? 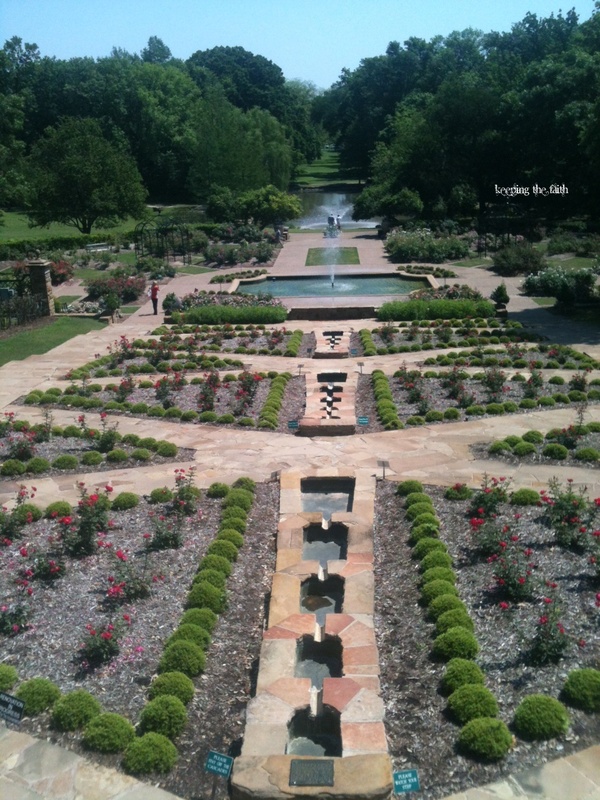 I love the formal rose garden. Even its present state of reconstruction, it’s absolutely spectacular. 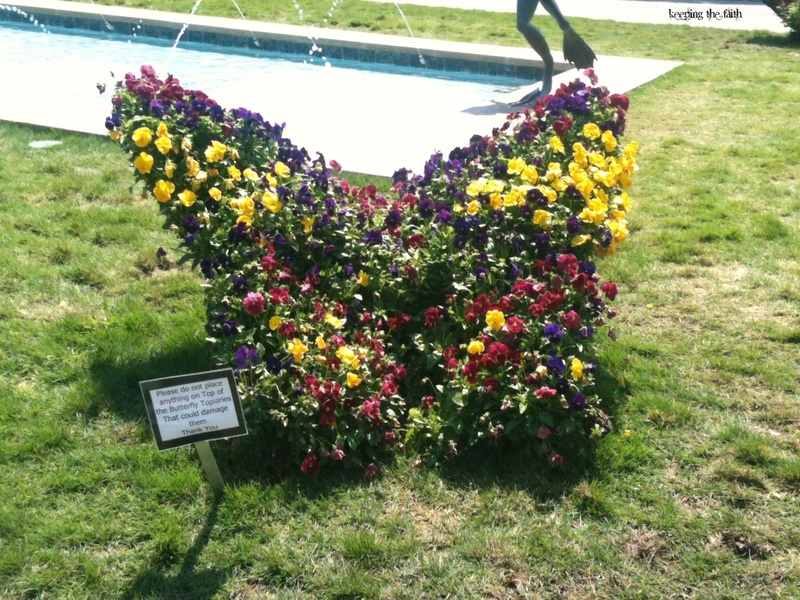 Next winter, I am totally going to make a butterfly shaped pansy topiary and put it on my front porch. Really. The day was beautiful and I ended up spending just a little too much time meandering around the gardens on my bike. Which means I was left with ten minutes to get back to the office. Which in turn means I had to take “The Shortcut”. Yep. That’s The Shortcut. Short in terms of time and distance. Not so short in terms of effort. I lifted the bike over my shoulder and schlepped it right up the staircase to get to the road above so I could skedaddle back to work. 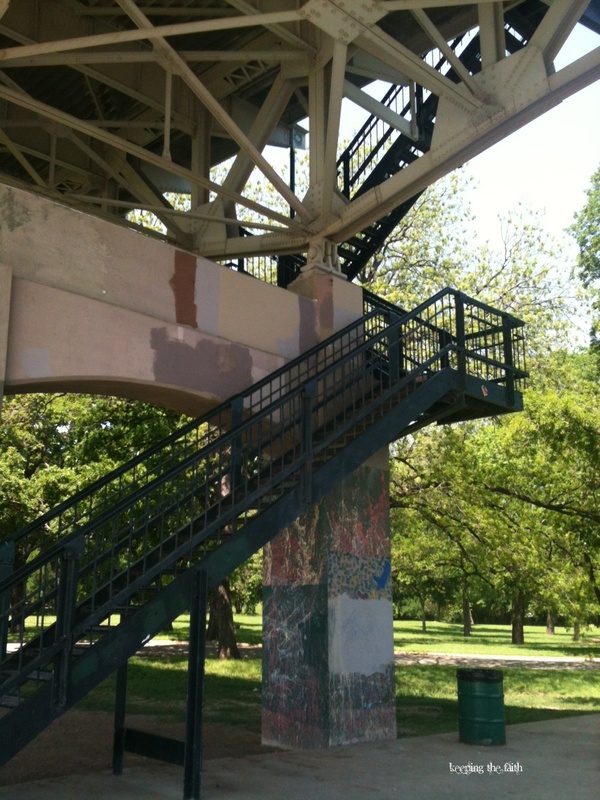 I received some strange glances from passing runners, and a big thumbs up from the biker at the top who was heading down the staircase with his ride as I was climbing up. Great fun! Take a Shortcut. Keep the Faith. No. THAT was no shortcut! But worth every step, as the botanical gardens are gorgeous!